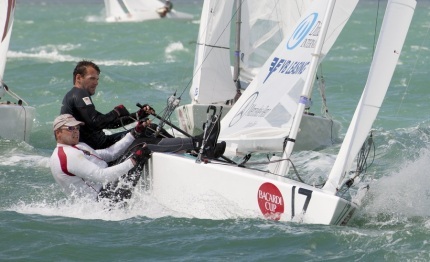 March 8, 2012 (Miami, Fla.) – Racing got underway in earnest today for the five classes – Star, Viper 640, Audi Melges 20, Melges 24 and J/80 – competing in BACARDI Miami Sailing Week (BMSW) presented by EFG Bank. The Star fleet, competing for the 85th BACARDI Cup, had started racing on Monday but was sidelined for the last two days as a weather system generating high winds and hazardous marine conditions sat over the area. Today, with easterly winds in the upper teens, the Stars resumed their series, joined by the Melges fleets who shared racing on one circle and the Viper 640 and J/80 classes sharing another. In the first race of the day for the Star class 2008 Olympian Peter O’Leary and David Burrows (Ireland) led around the first leeward mark followed closely by 2008 Star World Champions Mateusz Kusznierewicz and Dominik Zycki (Poland) and Xavier Rohart and Pierre-Alexis Ponsot (France). The positions remained intact as the three teams crossed the finish line. In race two, 2007 BACARDI Cup champion Hamish Pepper and crew Jim Turner (New Zealand) were leading at the first mark, followed by Kusznierewicz/Zycki and Rohart/Ponsot, but the Polish team succeeded in beating them across the line, with the French team finishing third. The win of the second race moved Kusznierewicz and Zycki to the top of the overall standings with three points, followed by O’Leary and Burrows with five. Day one leaders Hans Spitzauer, a five-time Olympian, and Gerd Habermueller (Austria) placed 9-5 in today’s races and dropped to third overall, where they are tied on points with Rohart and Ponsot. Two points back, Pepper and Turner stand fifth with eight points. The Audi Melges 20 class opened their series by completing three races, with two-time (’11, ’10) class national champion Michael Kiss (Holland, Mich.) standing atop the 34-strong fleet after posting finishes of 1-2-1 for the day. Paul Reilly (Chicago, Ill.) is second overall with finishes of 9-1-3 for 13 points, followed by Luca Lalli (Milan, Italy) who has 15 points after finishing 8-3-4. Two points back in fourth overall is Marcus Eagan (Madisonville, La. ), while Renato Vallivero (Mongrando, Italy) is fifth with 26 points. In the 21-boat Melges 24 class, Ireland’s Conor Clarke won the first race of the day, while Franco Rossini (Switzerland) placed second. Rossini then took the bullet in the second and third races of the day, not to mention the lead of the overall standings which he now holds with four points. Clarke is second overall with seven points, followed by Riccardo Simoneschi (Milan, Italy) who has 10 points after finishes of 3-5-2. One point back is Kristen Lane (Tiburon, Calif.) after placing 5-3-3, followed by Alan Field (Los Angeles, Calif.) who placed 4-11-5 for 20 points. The Viper 640 fleet also completed three races, all of which were won by the defending champions –Glyn Locke, David Chapman and Ian Nicholson (Isle of Wight). Lee Eikel (Mandeville, La.) drove to finishes of 3-4-4 for 11 points, and Craig and Deborah Wilusz (Ft. Walton Bach, Fla.) are third overall with 15 points on finishes of 2-8-5. Fourth in the standings are Phil and Wendy Lotz (Newport, R.I.) with 16 points, followed by Justin Scott (Greenwich, Conn.) with 18. In the all-American fleet of nine J/80s, Glenn Darden (Ft. Worth, Texas) leads the standings with five points after winning the second and third races today. Gary Kamins (Pacific Palisades, Calif.) is second with eight points on finishes of 2-4-2, followed by Rick Schaffer (Ft. Worth, Texas) with 13 points on finishes of 4-6-3. Fourth overall is Henry Brauer (Marblehead, Mass.) after finishes of 6-3-5 earned 14 points. Nizar Abuzeni (St. Paul, Minn.), won the opening race of the day which he followed with finishes of 7-8. Abuzeni is currently fifth overall with 16 points.